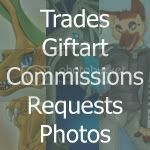 Giftart, requests, trades, commissions... you name it! These pictures were drawn by others and are somehow related to me and/or feature my characters. Please let me know if I missed you! Hey! That's cool! I can see my drawings here, LOL! I find and inspiration to draw something for you when ever I can! I love to draw for you! I know this is from a while ago, but she's lonely and wants to join your other gift art. *Nods* And thats a cut and print! You seem to really enjoy yourself.